How do you want to change the world and how can we help? We manifest your vision through design. We build capacity through collaborative skill-sharing. Through workshops, an interactive show and zine, community engagement, and a book for Sexual Assault: The Roadshow we collectively explored the nuances of sexual violence on campus. We inspire possibilities through accessible resources. Our free and downloadable how-to series is designed to make our skill sets accessible to the communities with whom we work. 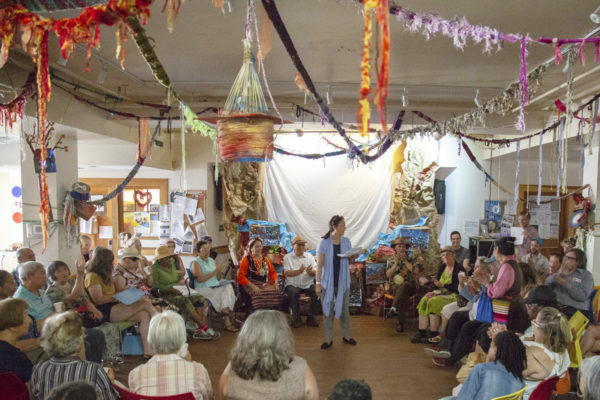 Weaving Home is a community arts installation exploring the meaning of home through collective journeys and adventures: what we find along the way, what we leave behind, and our ability to create home wherever we end up. Created by Parkdale community members, in collaboration with artists through Making Room Community Arts, the installation presents a variety of cardboard way stations and bridges that tell stories of the choices, support, and memories of home that we carry within us. Repair Café Toronto is a grassroots, volunteer-run group that organizes events and workshops in Toronto for people to come together and repair household items. Join us on May 4th from 1:00pm-4:00pm for a mini repair café at our studio with volunteer fixers specializing in fixing small appliances, home electronics, housewares, and bikes, in collaboration with Bike Pirates Toronto! In this edition, we’re speaking with Mercedes Sharpe Zayas, former researcher for The Public and current collaborator via Parkdale Activity-Recreational Centre (PARC) and Parkdale People’s Economy. Mercedes produced our zine on Art, Design, and Gentrification that looks at ways we can resist the ways gentrification often uses art and design to push marginalized communities out of their neighbourhoods. We are a group of activists and creatives invested in making a more beautiful and just world. We work collaboratively to deliver work that is creatively, emotionally, and intellectually uplifting, that challenges oppressive ideas, and that empowers people to pursue real change.